Helpless Victorian Ladies? Think again! I’m sharing a link to an entertaining post from the blog Strange Company entitled innocently enough, “Newspaper Clipping(s) of the Day” but whose contents belie that bland description. OK, this woman seems to be over-reacting a bit. Based on clippings from the “Illustrated Police News“, one of the most sensationalist London newspapers of the day, the post contains illustrations of Victorian women taking matters into their own hands when accosted, insulted, or otherwise violated. These ladies are definitely self-rescuing. I can imagine a female steampunk character emulating these ladies. 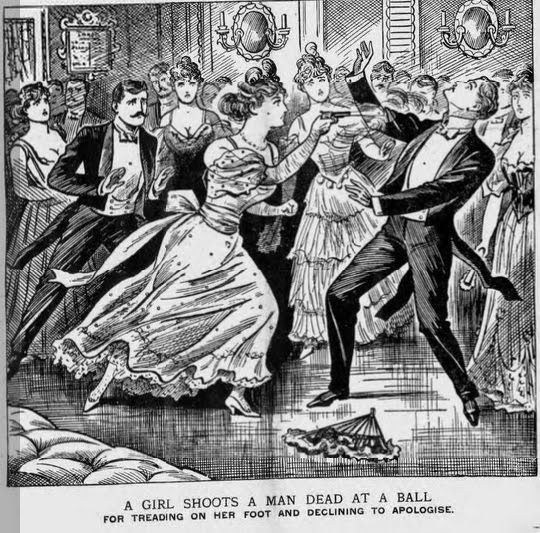 In fact, I have a character taking after the woman in March 28, 1896’s drawing when accosted by an evil-doer. This entry was posted in Steampunk and tagged steampunk, Victorian by mjtierney1. Bookmark the permalink. Want an insight into tough Victorian women?